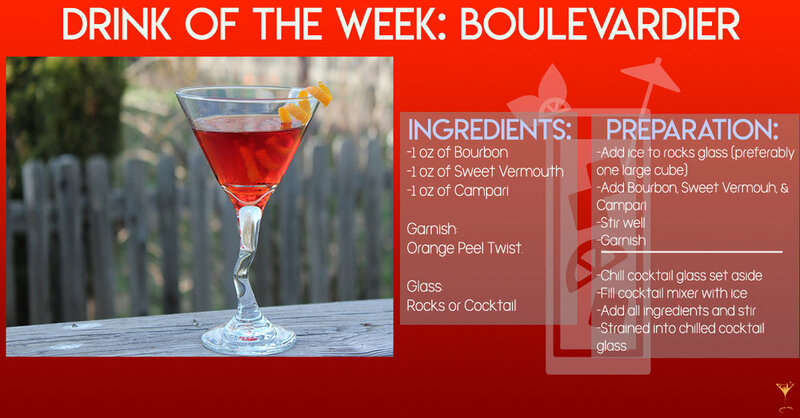 The Boulevardier is meant to be said with a great French accent, but this is actually a great American classic. A cocktail that’ll have you feeling so fancy you might as well be in Europe. And with little surprise it’s made up of a lot of European ingredients we have been learning about! The Campari Sweet Vermouth, you remember right? Cool let’s dive in. If you’re a Negroni fan the Boulevardier might seem similar- good eye! Those who don’t don’t worry, they do look identical, even we can admit that. The main difference is the Boulevardier is made with bourbon or rye instead of gin, they do share the Campari and Sweet Vermouth in similarity. However, you never want to be caught calling them the wrong name as both cocktails have always been taken super seriously. If you’ve never experienced the mix between sweet and sweet-bitterness of the liqueurs involved, try this before a Negroni. The whiskey blends well with the two, making it similar to an Old Fashioned as well. It’s light but also fierce in taste. Experts call the two cousins. The term Prohibition Era Cocktail gets redefined a lot, but the only thing that was revolutionized was the cocktail itself. Thanks to the Volstead Act Harry McElhone packed up his New York Bar in the Plaza Hotel, NY to Paris. He was known throughout Europe for serving and selling pre-Prohibition Era cocktails and new drinks, thanks to the abundance of ingredients he couldn’t get back home. Henry escaped, created a cocktail book in 1927 and that’s where the first recipe of the Boulevardier is seen. He gives credit to famous writer Erskine Gwynne, who was better known as socialite and nephew of railroad tycoon Alfred Vanderbilt. Gwynne was the publisher of his own Parisian magazine called The Boulevardier et voilà! A drink is born. We bet you’re scratching your heads about this one. The answer to the question: which came first- the Negroni or the Boulevardier? The Boulevardier. Negronis weren’t around just yet, they were 20 years away, because in 1927 Americans had never heard of Campari. Gwynne was actually born in the U.S. but had made his way to Europe as well. The Vanderbilts were once the wealthiest family in America. Anderson Cooper is a descendant. What better way to celebrate the holidays, than to serve a cocktail that not only has an exquisite taste, but also has rooted in history and present time! Let us know if you try it at home, send us a picture, and don’t be afraid to experiment with different recipes and create your own. After all, that is how all drinks are created!